Size 16 NEW LOOK Navy Sequined Dress.... Free Postage!! Size 16 NEW LOOK Navy Sequined Dress....hidden zip at the side.... good used condition.... Free Postage!! Dispatched with Royal Mail 2nd Class. New look Sparkly Black dress size 10. Condition is Used. Dispatched with Royal Mail 2nd Class. New Look Black Sequin Sparkle Mini Cami Bodycon Dress Size 12 NBW. Dispatched with Royal Mail 1st Class. Beautiful Ladies New Look red glitzy party dress size 14 with round neck and v at back of neck. Pretty dress just right for that special party. Blue/floral summer dress, size 8. Sequin detail. Excellent condition, New Look. Blue/floral summer dress, size 8. Sequin detail. Excellent condition, New Look.. Condition is Used. Dispatched with Royal Mail 2nd Class. Brand new with tags New Look Red Sequin Party Dress Size 6 petite. Condition is New with tags. Dispatched with Royal Mail 2nd Class. Brand new New look black and silver sequin dress size 10. Condition is New with tags. Dispatched with Royal Mail 1st Class. Gold By Giles Sequined Off the Shoulder Dress. Condition is Used. Dispatched with Royal Mail 1st Class. Size 16 (Petite - would be better for a 12/14). It is a small 16! I would say its more like a 14. Womens Size 12 Gold Sequin Dress from NEW LOOK. Off the shoulder Condition is Used. From a Smoke Free Home UK Buyers only. Black Sequin One Shoulder Mini Dress New Look Size 16. Condition is Used. Dispatched with Royal Mail 2nd Class. Women’s Sequin Dress Kelly Brook collection at New Look Size 10 Good used condition - small area to front of dress, in the middle that has a few missing sequins (as seen in photos). 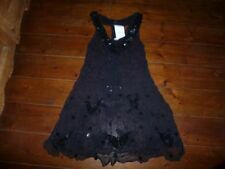 BNWT New Look Sequin Star Skater Dress - Party Black. Condition is New with tags. Dispatched with Royal Mail 2nd Class. New Look Premium dress size 12. silver or black changing sequins colour. Strappy. Dispatched with Royal Mail 2nd Class. This dress hasn’t been worn due to change of plans. Perfect for party, town or a festival. It is toght fitting on Chest with a zip and then slightly looser around thighs. Any questions please ask. Black One Shoulder Sequin Dress Size Small 12 New Look !! Gorgeous black mini one shoulder dress by New Look ! Size says 12 but more like a size 10 or small 12 ! Excellent condition worn once! Perfect for Christmas! Black 1920 Style Dress. Dispatched with Royal Mail 1st Class. New Look Sequin Dress Bronze Gold One Shoulder Asymmetrical 10. Condition is Used. Dispatched with Royal Mail 2nd Class. Worn a handful of times. Good condition however some sequins have been lost as general wear and tear however this isn’t really that noticable once on, only selling as I no longer wear it but it make a great Christmas party dress. Come from a smoke free home. Posted next working day. Fully sequined on the front as pictures show none missing. Pictures show from all angles, and I have tried to catch the sequins in the light to demonstrate the sparkle. Short sleeved with a v shape back which is not to low. Wonderful apricot dress. Lined. Short dress with a lace overlay asymmetric hem. Floral croquet with sequin embroidery. Padded bust. non stretch. BLACK WITH GOLD / FLORAL ROSE SEQUINS ALL OVER. NEW LOOK DRESS UK 10. BUTTON FASTENING AT THE TOP OF THE BACK. NEW - SEE PHOTOS HAS A FEW SEQUINS MISSING IN PLACES - NOT OVERLY NOTICEABLE AS THERE'S SO MANY. Burgundy Red Sequin Mini CAMI Swing Party Dress. KELLY BROOK @ NEW LOOK . Size 14 but will fit a UK 12-14. There is no give to the material. See all pics. NEW LOOK STRAPLESS SEQUI NAVY BLUE DRESS SIZE 14. HAS RUBBER GRIPPER AROUND TOP OF BUST LINE TO HOLD DRESS UP. Tunic Dress. New Look Premium. Black with Beautiful Floral Design. Stunning silver sequin prom dress - worn once, been sitting in a cupboard ever since! Originally bought for £120 from New look. Strapless, mini dress comes to just about the knee- is a real statement piece. Has a tiny mark on the satin band, discounted price because of it! Has been dry cleaned. Ready for its new home! Fabulous Petite Size 8 Pink Sequin Mini Dress Condition is Used. Dispatched with Royal Mail 1st Class. Floral sequin pattern to front. In good condition. Free from any dirt or marks. In great condition except for the back tie which needs stitched or wundaweb. Gorgeous silver tear drop sequins. New Look Black Sequined Dress with Spaghetti Staps Size 16 (Closer to 14 actual). Condition is Used. Dispatched with Royal Mail 1st Class. Amazing sparkly detailing all over with real embroidered flowers randomly placed over the rose gold sequins. Stunning rose gold sequinned dress. Defect is a tiny line of little sequins missing as seen in photo 4 . Sequin party dress for sale I have the blue colour for sale only. This item is a midnignt blue Size 16 Brand new with tags Rrp £35 Grab a bargain I have many items for sale on my other listings. Kindly have a look. New look special edition Party dress. Fully sequined in black with real embroidered flowers randomly placed. Size 16 sparkling grey tunic dress with stretch. Excellent conditioned dress in a size 12. 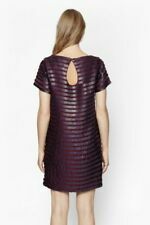 Deep-red/maroon coloured, with a short mini dress length. Parisian Silver Sequin Bandeau Dress 💗 Size UK 8. Condition is Used. Dispatched with Royal Mail 2nd Class.